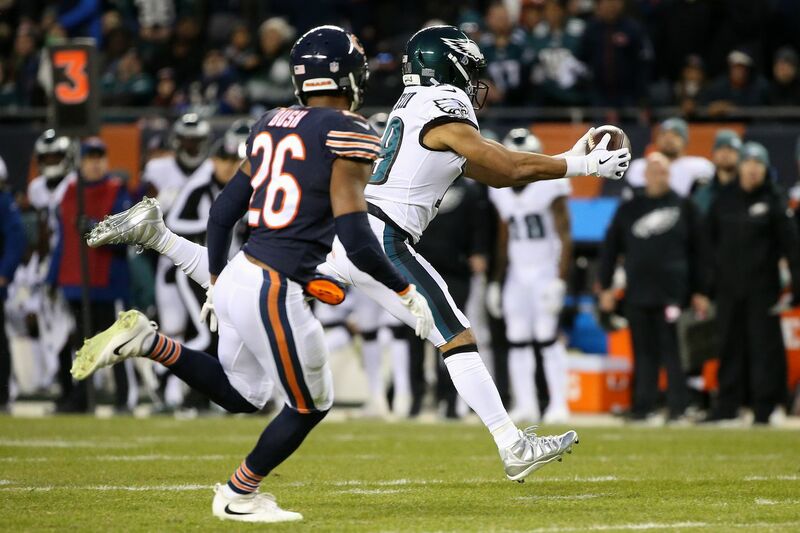 Golden Tate made some big catches in the Philadelphia Eagles' playoff win over the Chicago Bears at Soldier Field. The Eagles beat the Bears, 16-15, to advance in the playoffs. They’ll face New Orleans on the road next Sunday. Jeff McLane offers up which players are trending up and which are trending down following the win. UP — Foles' Cinderella run continues. Two first half interceptions — particularly the second when he threw to Nelson Agholor in a sea of Bears defenders — were costly. But Foles rebounded in the second half and tossed two touchdowns — the second a game-winning sprint out to Golden Tate. UP — The ground game wasn’t working in the first half, so Pederson decided to pass more on early downs and it helped make the difference after the break. The Eagles coach won another nail-biter. UP — The trade that many hated — even after the Eagles started winning — finally paid off. Tate showed onions with a tough, 20-yard catch over the middle. And snagging the game winner was more than the icing on the cake. UP — The Eagles receiver had been clutch in the last three games of the regular season, and he brought that same big-moment mentality to the playoffs. It was a great return to Chicago for the former Bear. UP — The Eagles defensive coordinator has done one of his best jobs over the last month. Despite being down to the bottom of the roster in the secondary, Schwartz somehow found a way to scheme up win after win. Holding the Bears to 15 points qualifies as top notch. DOWN — Maddox looks like a rookie who’s going to have a solid NFL career. But the Bears picked on him unmercifully with double moves and he wasn’t up for the challenge. The cornerback should learn from his struggles. UP — The Eagles tackle combined to hold the dangerous Khalil Mack to no sacks. The Bears linebacker had some moments — he almost always does — but it wasn’t enough. UP — Tarik Cohen had been the Bears' "X" factor all season. The Eagles needed one guy to shadow him and that it was Jenkins came of little surprise. The veteran safety was more than up for the challenge, and kept the dual-threat running back from doing much of anything on offense. UP — Pederson went heavy with his “11” personnel package (3 WRs), and Goedert had to do more watching than he’s done over the last month. But when the Eagles dialed one up for the rookie tight end, he delivered, beating Bears safety on a post for a 10-yard touchdown. UP — The Eagles picked the slot cornerback up off the street as their secondary was being decimated by injury. Of the carousel of defensive backs who joined the team, he has been the last one standing. He was impressive Sunday, with pass breakups and big-time tackles. DOWN — Mitch Trubisky gifted a sure interception to Sullivan before the half, but the safety dropped the pass and the Bears took a 6-3 lead into the break with a short field goal. Maddox could have had a first-half interception, as well. UP — The Eagles linebacker was all over the field. Bradham was quiet for the first two months of the season, and then he broke his thumb, but he had been better of late and brought the hammer Sunday. DOWN — Bennett got baited into an unnecessary roughness personal foul by Bears guard Kyle Long, but the veteran end should have known better than to throw an extra shot after the whistle. The penalty negated a third down stop and Chicago would eventually net a field goal on the drive.